Proactive innovation. That’s been the Ohmega hallmark for five decades. Over that time, we have been proactive in meeting the constantly changing and demanding requirements of the design engineer. By focusing on innovation, product improvement and enhancements, our in-house manufacturing and technical personnel have continuously introduced new OhmegaPly® products that have kept OhmegaPly® as the benchmark for embedded resistive materials. OhmegaPly® is widely used in many military/aerospace applications where reliability and performance are critical. Many of today’s jet fighters, like the F35, use OhmegaPly® in a variety of parts, including their advanced radars. OhmegaPly® can be found in many other military/aerospace systems including missiles, UAV's (unmanned aerial vehicles), radar antennas, telecommunications devices and smart munitions. OhmegaPly® is used in number consumer products, including MEMs (Micro-Electro Mechanical System) microphones for cell phones. Over a hundred million OhmegaPly® circuits are produced annually by Far East production printed circuit board shops for a variety of consumer applications. High volume throughput and a consistent and reliable source of material supply make OhmegaPly® ideal for cellular and other consumer devices. In addition, excellent technical support from Ohmega Technologies factory-based personnel coupled with local-based technical and sales support equates to the successful and growing global use of OhmegaPly®. OhmegaPly® is used in a variety of applications where the ability to embed resistors within layers of a multilayer circuit board is desired. Applications include use in medical electronics, computer systems, telecommunications devices and RF circuits. OhmegaPly® is the material of choice by PCB designs who desire a field proven, minimal risk, embedded resistor technology. Ohmega Technologies, with over 40 years of experience in the manufacture of OhmegaPly®, offers unrivaled technical, engineering and production support. Contact real people to get the information you need, when you need it. Ohmega Technologies has a wealth of knowledge to share and resources available to support your embedded resistive material projects. No matter the application, there is an OhmegaPly product to fit your specific needs. Ohmega Technologies Inc. now has available OhmegaPly 377-FS. OhmegaPly 377-FS is a 377 ohm per square material targeting RF absorber applications; OhmegaPly 377-FS Product Brief. For more information please contact Bruce Mahler at 310-559-4400 or at bmahler@ohmega.com. OhmegaPly RCM (Resistor Conductor Material) consists of ED (electrodeposited) copper foil and NiP (Nickel Phosphorous) resistive alloy. The NiP metal alloy is plated electrically onto the matte, or tooth side, of the copper foil. 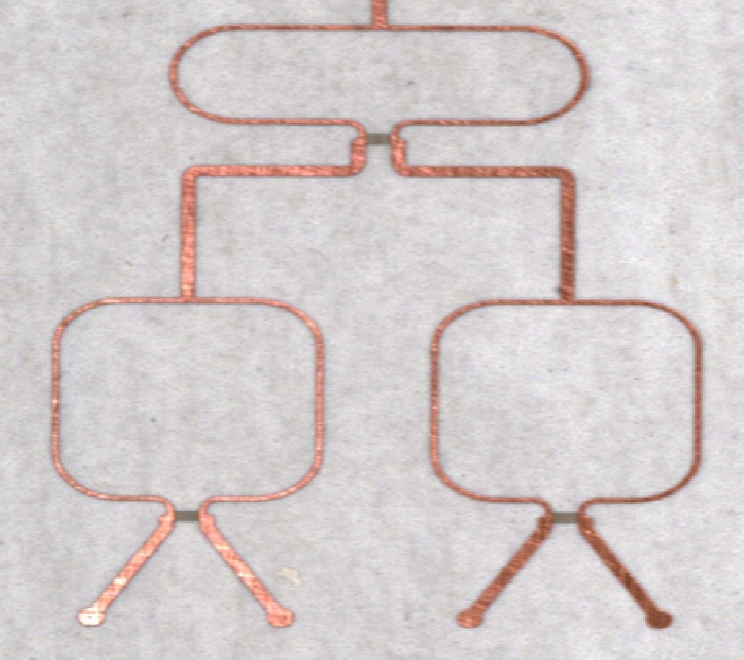 OhmegaPly RCM is laminated to a dielectric material (like any other copper foil) and subtractively processed to produce copper circuitry and planar resistors. OhmegaPly RCM can be bonded to almost any dielectric material including FR4, Lead-Free, Polyimide, PTFE, LCP and flexible dielectric materials. OhmegaPly laminates are offered by Ohmega Technologies who subcontracts the lamination to the Independent Laminators. It is also directly available from Arlon, Rogers and Taconic bonded to PTFE and other RF dielectric materials. OhmegaPly® MTR® technology allows thin film resistors to be built within a printed circuit trace that is less than 100 microns (0.004") wide. Using standard subtractive printed circuit board processes, it is ideal for high density interconnect (HDI) designs where passive component placement is difficult or impossible. 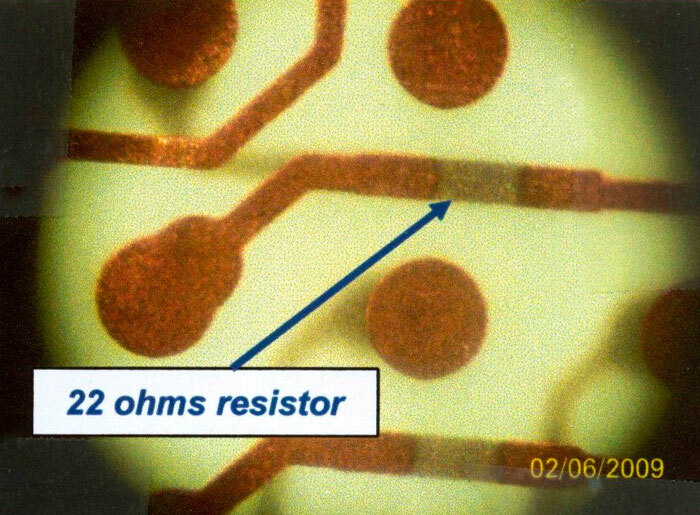 By utilizing the differential processes unique to the OhmegaPly® nickel phosphorous (NiP) resistive material, copper traces can be imaged and etched to define resistor widths that are precise and sharply defined, resulting in the creation of miniature resistors with consistent ohmic values. With low inductance and good tolerances, the OhmegaPly® MTR® resistors are ideal for line termination and pull-up/down applications. To learn more, contact Bruce Mahler at 310-559-4400 or by email. OhmegaPly ORBIT is a 10 ohm per square sheet resistivity product that allows the embedded resistor to be built within a circuit trace. Ideal for low value termination applications, OhmegaPly ORBIT is used in many high density designs where space is a premium, enabling higher I/O and component densities and reduced form factors. OhmegaPly ORBIT has a tight 3% material tolerance, which allows for very small resistor footprints and excellent finished resistor value tolerances. OhmegaPly ORBIT is also used in a variety of other applications, including as OhmegaFlex heaters and large area radomes. 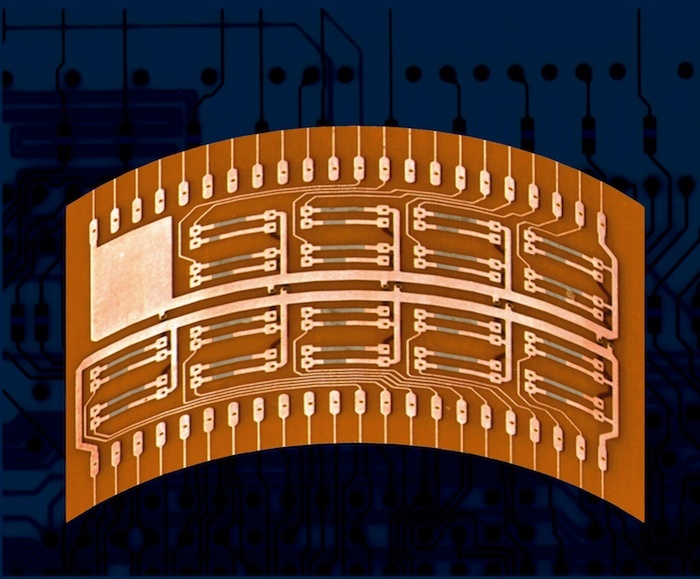 OhmegaPly RCM can be laminated to flexible substrates and used in flexible or rigid-flex applications. 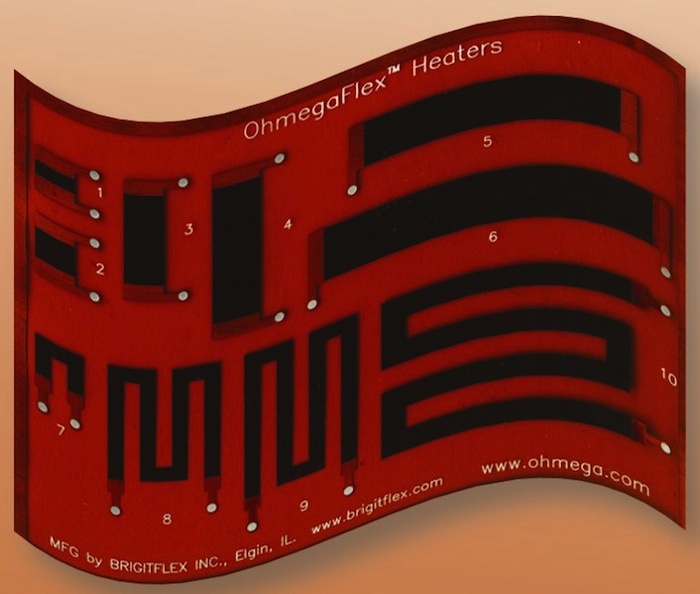 OhmegaFlex is used as heater elements, flex cable terminators and in other packaging applications where circuit height and flexibility are critical. OhmegaPly resistors are very stable on flex materials and repeated flexing of an OhmegaPly resistor (either embedded in a multilayer circuit or with coverlay for surface resistors) does not cause a change in resistor value. OhmegaPly enjoys wide use in a variety of microwave and RF circuits. Phased array antennas, Wilkinson power dividers and resistive cards (r-cards) are a few applications that have employed OhmegaPly. 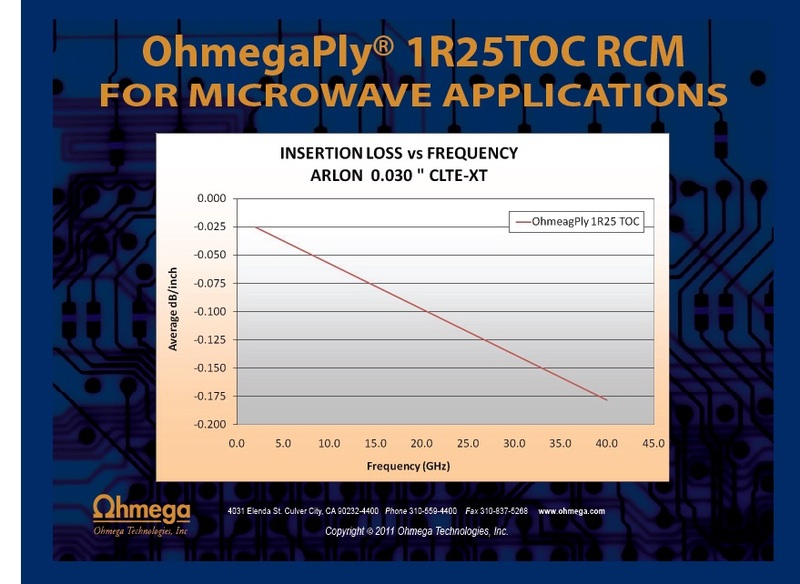 Integration of OhmegaPly into microwave circuits has many desirable benefits including greater packaging densities, elimination of resistor assembly, weight savings and reduction in the parasitic inductances and capacitances associated with discrete chip resistors. 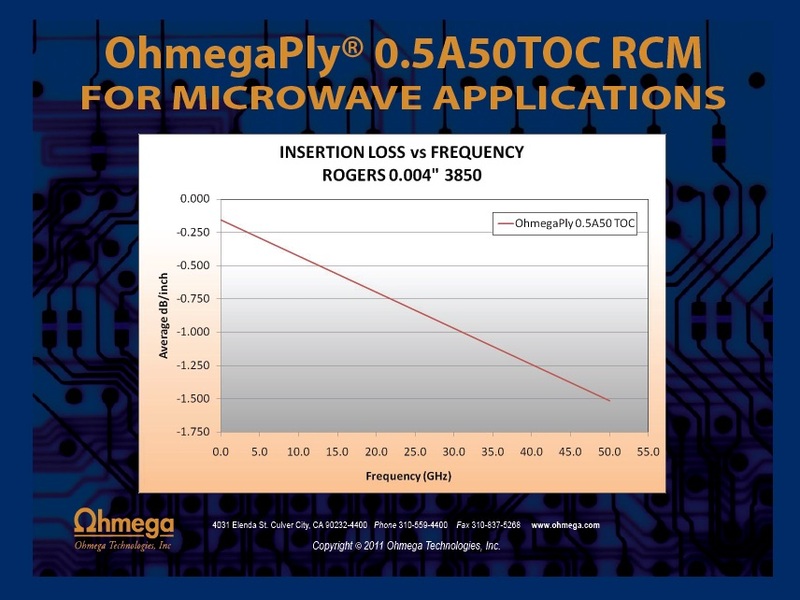 OhmegaPly has been tested beyond 40 GHz with excellent stability and low insertion loss primarily due to the low profile nature of the copper foil that is used for bonding to PTFE substrates. OhmegaPly is available on Arlon, Rogers and Taconic substrates as well as other low dielectric constant/low loss materials. Ohmega/FaradFlex is a combined resistor/capacitor core consisting of OhmegaPly RCM laminated to Oak-Mitsui’s FaradFlex capacitive laminate materials. The combined product allows for embedded RC networks on the same inner layer core of a multilayer circuit board. Using standard subtractive PCB processing, the combined product yields discrete embedded resistors and distributed or discrete capacitors. World-wide patents are held jointly by Ohmega Technologies and Oak/Mitsui. Here’s a helpful guide for spec’ing OhmegaPly in your projects. Open the Technical Library for instructions. OhmegaPly embedded resistors can be used in an ever-growing range of applications. Globalstar and Iridium satellites, radars, antennas, control cards, SAL heaters, R-Cards, etc. ORBIT® BGA Termination, Interposers, servers, routers, IC modules, memory cards, etc. MEMs microphones, automotive control circuits, memory modules, potentiometers, etc. Power Divider, R-Cards, Absorbers, etc. Image Memory Controller, Image memory controller, heater elements, etc. Has shown absolute reliability for five decades. And always will. For five decades OhmegaPly® has been used in a variety of electronic devices, spanning a broad spectrum of the Electronics Industry. Applications range from consumer electronics (smart phone MEMS microphones) to aerospace and defense electronics (satellites, space probes, missiles and fighter aircraft). OhmegaPly's strength has been its ability to be used in a variety of new ways in new applications. OhmegaPly acts like a resistive “blank slate” – providing the PCB designer with a key tool for addressing contemporary electronic issues requiring passive resistors or resistive films. We know that demanding applications require the most consistent and highest quality product possible. Quality and technical oversight in the production of OhmegaPly, onsite at Ohmega Technologies, assures the lot to lot consistency and 100% traceability of all OhmegaPly products. OhmegaPly--five decades of consistent reliability and dependability, five decades of constant product improvements, new product introductions and ongoing product enhancements. Call us at (310) 559-4400 to see how we can help you too. For five decades, OhmegaPly® embedded resistor-conductor material has demonstrated absolute reliability in billions of circuit boards and trillions of component hours of operation.